The Longevity Bulletin is published twice a year and it presents and explains actuarial perspectives on population longevity and looks beyond the actuarial world for statistics, research and the latest thinking on related subjects. Each publication provides general and technical perspectives to best address relevant longevity topics. Issue 11 - Advances in technology bring with them implications for mortality and longevity trends. Developments such as e-cigarettes, community technologies to support self-care, wearables and the Internet of Health Things already have a daily impact on people’s health and behaviour. And with driverless cars no longer science fiction, and research into extending human life being undertaken, how might the insurance industry respond to disruptive change? 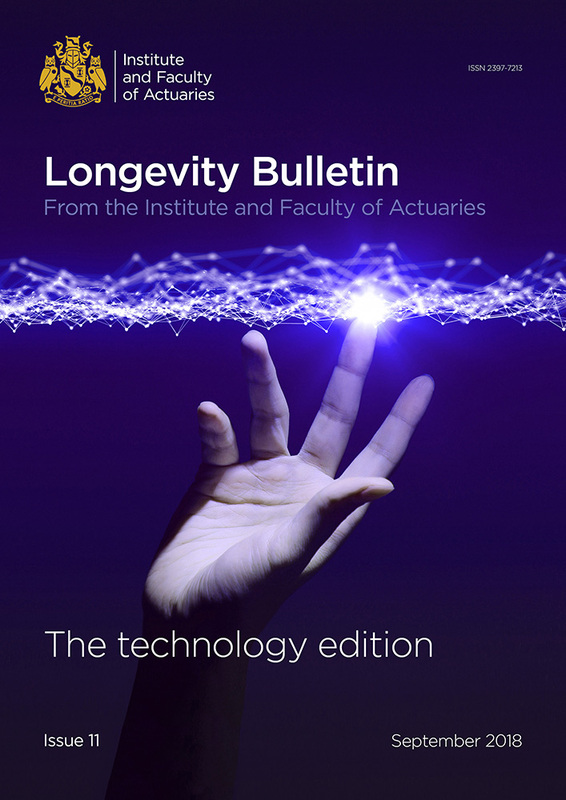 This edition of the Longevity Bulletin examines these areas and highlights key issues for consideration as the relationships between society and technology continue to evolve. Longevity: Is the tide turning? Issue 10 – Over the last century, life expectancy has increased significantly around the world. However, in recent years, the rate of this improvement appears to have slowed in some countries. For the first time, the IFoA has joined forces with the Society of Actuaries (SOA) in the US and the Canadian Institute of Actuaries (CIA) on its latest Longevity Bulletin, ‘Longevity: Is the tide turning?’, which considers these emerging trends and the possible drivers for the change. Issue 9 – Big data is now being used to predict epidemics, cure diseases, improve quality of life and avoid preventable deaths. In other words it provides new measurement capabilities for doctors but also for insurers, regulators and even patients themselves. This Longevity Bulletin presents a number of theoretical and practical examples on the uses of big data. It also outlines some of the world-class research activities and goes into detail on the challenges from using biomedical data. Issue 8 – Antimicrobial resistance (AMR) is perceived as a growing threat to health and well-being globally. Drug-resistant infections are estimated to cause 10 million deaths a year and cost up to £66 trillion by 2050. This edition of the Longevity Bulletin examines the clinical implications, impacts on longevity and the potential economic cost of current trends in AMR. It also goes into detail on new research and discoveries in creating new antibiotics.